Jane Godfrey and Sondra Radcliffe of Ambiente Art Glass specialize in unique, handcrafted, stained and kiln formed glass. Although they recently moved from Cleveland Heights to Oregon, we loved their work so much that we couldn’t let it leave, too! 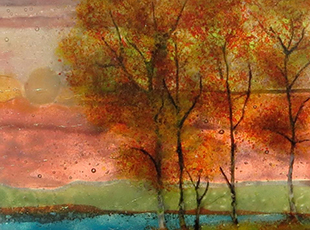 Come view a selection of their fused glass paintings and plates in the store this month, and enter to win our giveaway for one of their lovely landscapes. A winner will be drawn on November 1. Congratulations to our September winner, Sarah Marein!